If you’re running a company website without an analytics dashboard, you may as well be stumbling around in the dark. Building a viable and sustainable web presence in any industry is all about understanding the needs of your users and tailoring your service to fit their needs — how can you do that if you don’t even know what your users are looking at or how they got to your website? The good news is that analytics dashboards simple to implement, and they also come in a variety of shapes and sizes to suit the needs and goals of your small business. While some people swear by Google Analytics or the tracking plug-ins found organically within their specific web hosting or content managing service (think WordPress analytics), there’s a lot of information you may not be getting from these sources. For example, while Google Analytics does a great job tracking individual page vies, it doesn’t necessarily break down any meaningful social sharing or referrals. You may want to know why a specific webpage on your site garners major traffic, but Google Analytics will only note that it comes from Facebook. If you’d like to obtain a more tailored or granular look into your website, it’s best to make an investment in a third-party analytics dashboard that offers exactly the data that you need. You may find that you’ll not only be able to target the audience interested in your website, but you’ll also be able to optimize the content and structure to bring in more potential consumers in the long run. Do you have an analytics dashboard you swear by? Let us know in the comments. Do you maintain a website that has only a few pages of static content or delivers periodic (but not super-frequent) content updates? 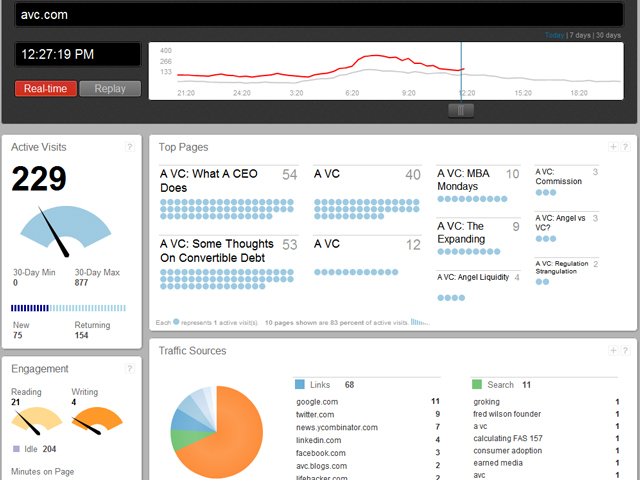 Then you may benefit from Chartbeat, a pumped-up analytics dashboard that offered real-time analytics before Google did. The service’s dashboard is really simple — log in at any time and get a bird’s-eye view of every user on your site, including what page they’re on and where they came from. In addition to marking key traffic flow, Chartbeat also keeps tabs on the “engagement level” of each user. Specifically, anyone controlling the dashboard can check the level of users who are reading or writing on or about a particular page, as well as how many users are considered “idle.” The combination of this data can give you the best idea of when, where and how users are reaching your site, allowing you to adjust your content or SEO accordingly. Interested in how it works? Chartbeat actually offers a free 30-day trial of its services, and from there pricing plans begin at $9.95 per month. If you have a small budget to spend on analytics, this tool could serve you well and help you grow your online business. And If you’re in ecommerce, be sure to keep an eye out for Chartbeat’s savvy, up-and-coming cousin, Shopbeat. HootSuite is an oldie, but a goodie — it’s still the premier dashboard for companies looking to get analysis of their social media efforts. If your company spends more time on Facebook and Twitter than a website or blog, HootSuite doubles as both a social media manager and analytics tabulator. 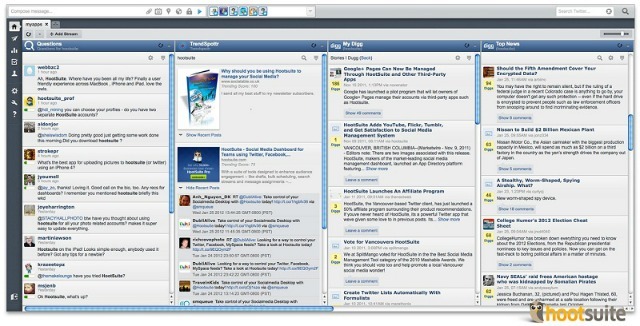 In many ways, your never need to leave the HootSuite dashboard to manage your day-to-day engagement. The platform allows you to write and schedule posts on nearly every social media website in existence (the company recently added Digg, InboxQ and Trendspottr to its ever-growing list of served platforms) and then track the resulting conversations and referrals. The dashboard also pulls in data from Google Analytics andFacebook Insights to provide data of how campaigns are directly affecting home websites and Facebook Brand Pages. Another reason HootSuite remains popular is its low cost. The Pro Plan price for the dashboard is a paltry $5.99 a month, and it offers all of the above features. One downside, however, is that if you’re looking for a whole team to be simultaneously locked in to the system, you’re going to have to pony up an extra $15 for each additional admin. But if you’re looking for a way to deftly manage social media in a way that will drive potential companies or your website — and to a sale — then HootSuite is a dashboard worth paying for. Is yours an up-and-coming company with high content output and striving for major visibility in the web space? Well, it’s time to make investment in Parse.ly Dash, the “predictive dashboard” that pays special attention to what’s trending right now and how to capitalize on what everyone is talking about on the Internet in real-time. If you’re looking for analytics that drill down, separate and categorize every page on your website, Parse.ly Dash will be more than happy to serve you. You can sort your content by author, topic, page and referral to get a good idea of not only where everyone is looking, but what sort of content to produce further down the road. Parse.ly Dash will actually suggest what topics your website should write about, and what trends are just breaking on the surface. The analytics dashboard offers multilateral control to the user in a more comprehensive way than most products do — you can essentially use it to plan for your website’s future content based on what your users respond to best. All of this control comes at a hefty price. The basic plan starts at $500 a month, well out of the price range of most startups and average businesses. But, if you’re looking to produce a content-heavy and highly engaging website, Parse.ly Dash will help take your website to the next level.